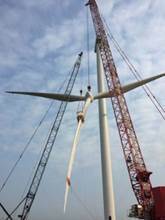 News Release from Deutsche Windtechnik Ltd. The independent full-scope O&M provider Deutsche Windtechnik and the Danish company for technical engineering services Eltronic Wind Solutions signed an agreement yesterday for the sale of two rotor blade clamp types at the Hamburg WindEnergy 2018 trade fair, with which the complete rotor star can be installed and uninstalled even more efficiently. Deutsche Windtechnik will use the rotor blade clamps for replacing major components of different system technologies and rotor blade types in Europe and the USA. "We are confident that the new rotor blade clamps will enable us to replace large components even faster and more safely. This will have a positive effect on crane set-up times, technical availability and therefore on the overall time and cost balance," said Torsten Wohlert, Head of Engineering Department (Siemens and Offshore Service) Deutsche Windtechnik Service, regarding the reasons for the purchase. The blade clamps, which are approved for Europe and the USA, can be easily adjusted to different blade sizes and types. This allows them to be used for major component replacement by Deutsche Windtechnik's European business units as well as by Deutsche Windtechnik Inc. in the USA. "The rotor blade clamps `Mechanical Blade Clamp 5T’ that we developed are a tool for handling and lifting complete rotors up to the nacelle," Henrik Toft Kromann, Senior Sales Manager Europe at Eltronic, explained. The rotor blade clamps are applied in the area opposite the rotor blade base around the outside of the rotor blade near the tip. When the rotor has been installed, the blade clamp can be detached using a remote control. Alle Meldungen Von Deutsche Windtechnik Ltd.